Corporate supplies are very useful organizational tools that project a professional image of any new corporation. *The above price is available only to lawyers who are registered with our firm and maintain certain monthly volume of orders. Regular retail price is $159.00, plus applicable taxes and delivery. Please contact us for details. The Legacy Kit features a high quality leatherette cover with gold detailing and is provided with an accompanying brass minute book plate that permanently adheres to the spine for easy identification. The functional 3-ring binder and slipcase format fits standard 12" shelving units. This quality register comes in a burgundy color. and their clients. High quality black vinyl cover, brass highlights and sturdy well-designed construction combine to provide the lawyer or entrepreneur with a presentation package that reflects their professionalism to clients. The Attaché kit comes with the award-winning Mark Maker Embosser in its own section of the case and a built-in handle for convenience. Both kits come with the award-winning Mark-Maker Corporate Seal (Embosser), Standard 10 Tab Set, Corporate Information Summary, a Directors Register, List of Officers, Shareholders Register, Securities Registers and Transfer Registers for Shares, Warrants and Debts, five sheets of blank paper and one set of ten Share Certificates. The Mark-Maker Corporate Seal is an award-winning embosser which seals your most important deals and records at the office or at home. 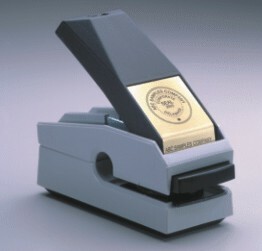 It is ideal for identifying legal documents, notary seals publications and books. Features include: Lifetime Warranty, Brass Index Plate, and an Easy-To Use Wide-Grip Handle that makes a perfect impression each and every time. This corporate seal fits perfectly inside our Attaché Kit package. The contents of these packages are pre-determined so as to simplify the ordering process.